Tuesday, April 10th, 2018 saw the arrival of the Sansar Slip, Slide and Sit release. As the name implies, this update includes the first iteration of the ability to sit avatars in experiences. Yes, it’s a simple ground sit, but it’s a start. The release also sees further avatar gestures (aka “emotes”), script API updates and a reminder aimed at creators on the removal of the Terrain Editor. As always, full details are available in the release notes, this overview just highlights some of the key features / items in the release. The ability to sit is Sansar has long been a request along those engaged in the platform. It’s been seen by the Lab as one of the more problematic issues to solve for, particularly for a number of factors. Firstly, there is the question of where should avatars be able to sit? In the physical world, we can sit almost anywhere that’s sensible (and a few that are not! ): on chairs, on stairs, on counter tops, on logs and rocks, up in the branches of trees, on the edge of a cliff, the railings of a bridge, in (and on) vehicles, and so on; and the Lab would like to have the ability in Sansar, and preferably without the need for custom scripting within the more “static” objects – railings, tree branches, rocks, etc., to make it possible. Then there is the “realism” factor. It’s been expressed that rather than having people point-and-click to have a script and animation effectively “grab” an avatar and seat it, a-la Second Life, it would be preferable to have an avatar be able to “walk up and sit down” as we do in the physical world. But – how should that be handled? By a more subtle form of scripting that “goes through the motions” for the avatar? But how would that work for people in VR? Would it be disorienting to find their avatar under “external” control, however briefly, as an animation takes over movement? What about the physical confusion for VR users… standing and controlling their avatar, then seeing it sit, and perhaps instinctively trying to sit as well – regardless of whether a chair is behind them or not? 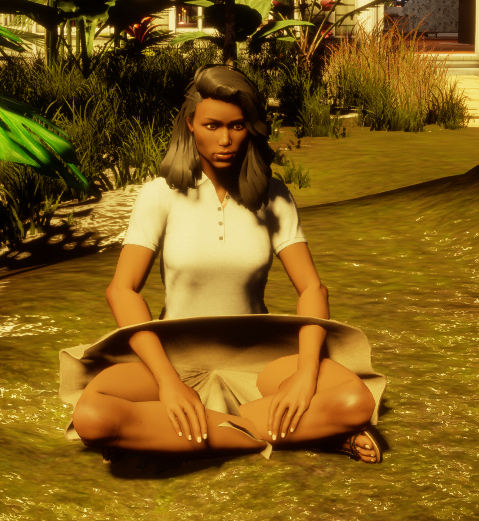 The one place we all can reasonably safely sit is on the ground – hence the first iteration of sitting in Sansar allows just that, with a simple “/sit” command. This activates a basic animation to sit your avatar cross-legged on the ground with arms resting on legs. To stand, simply hit a movement key, and your avatar will stand (and perhaps turn, depending on the key pressed). In Desktop mode, the animation works well – if you are wearing jeans, shorts, leggings, trousers, etc; if you’re in a skirt or dress, then it might not be so good and result in a case of knickers exposure and possibly other odd results if cloth physics aren’t employed in the skirt / dress. I’ve also no idea how it works in VR mode (I assume a controller command) as the release notes make no mention, and I am sans a headsets to test it myself. Cross-legged like this isn’t necessarily the most feminine of sits, so hopefully we’ll see some differentiation introduced – how about the more attractive leg tuck position for female avatars, LL? /wave – a reasonable wave, although a little more emotion on the avatar’s face would not go amiss, given it is intended to be a Friendly GreetingTM. /cheer – a two-armed cheer, which again given the lack of facial emotion seems (to me) to leave it devoid of any real feeling. /lol – something of a belly laugh of the kind we’re used to in Second Life, just without the over-the-top doubling over. And it actually has (a bit of) a facial emote to go with it! I confess these gestures / emotes provoke a mixed reaction in me. On the one hand, they add a degree of life to an avatar, on the other, the sheer lack of reflective facial emotion – a smile when giving a thumbs up or a wave, for example – tends to emphasise the mannequin-like artificiality of Sansar avatars, particularly for those coming to the platform from expressive environments like Second Life. Hopefully, this will improve in time, particularly if some means of providing a more comprehensive animation / animation override capability is made available. It would also be handy if the commands themselves could be “hidden” from display in the local chat window. Seeing lots of “/thumbsup”, “/clap”, “/cheer” gesture commands littering the chat window is a) distracting, b) can result in a lot of frustrating scrolling back up the window when trying to read something someone wrote. VR mode arm IK improvements: a set of updates to improve arm ikenema in VR mode. Again, lacking a VR headset, I’m unable to test these, nor have I seen anyone with a headset since the release in order to see if the improvements are visible. Marvelous Designer clothing updates: it is now possible to pin sleeves and scarves up in cloth simulation mode, and to pull zippers up or down. Lighting updates: all properties on lights can now be changed by scripts. Physics updates: a number of physics updates including new APIs to adjust nearly every physical property of objects at runtime; the ability to define motion types of models on import, and friction and bounce settings on static objects. The Sansar Script API documentation provides more information. Another compact release focusing on building out capabilities rather than adding a lot of new features. Like the March release, it’s unlikely to get those outside of Sansar feeling a “wow!” factor – but that’s not the intention. My own thoughts on things are given above, so I won’t repeat them here. Sansar needs cloth physics if it wants to be a next gen virtual world. It has them – in the “appearance editor” (LookBook) app. There are some performance issues to be addressed before it gets to Runtime.